Introduction: The peripheral ossifying fibroma is a slow growth benign tumor that may induce recurrence after removal. It is of fibro-osseous origin and it is commonly found on maxillary bone. It is of asymptomatic growth that may induce facial asymmetry. Objective: This article presents a clinical case of peripheral ossifying fibroma. 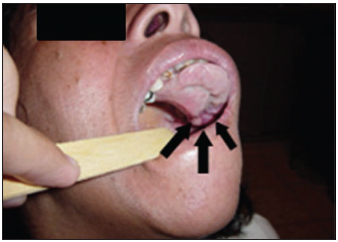 Case Report: A-32-year-old female patient presented a slow growth tumor in the maxilla; atypical for its dimensions and appearance; leading to facial asymmetry, masticatory, deglution and dysphagia problems. She underwent surgery for lesion excision and likely irritating factors, and was diagnosed with Peripheral Ossifying Fibroma. Conclusion: It is important to completely remove the lesion to reduce the possible recurrences; the periosteum, the periodontal ligament and other factors should be included. Peripheral ossifying fibroma is one of the most common inflammatory hyperplasia (excessive cell reproduction) injury affecting mouth cavity. In 1872, Menzel first described ossifying fibroma, but only in 1927 Montgomery (1) assigned its terminology. The literature reports a great incidence in infants and in young adults, mainly at the age range from 10 to 19; affecting especially females (2-4 times). Ossifying fibroma epulis; ossifying fibroma with calcification; peripheral cement-ossifying fibroma and calcifying fibroma are the terms which might refer to peripheral ossifying fibroma (2,3,4). At the histopathological exam we found stratified squamous epithelium, which might be ulcered or not, covering conjunctive tissue stroma with several fibroblasts. In the case of the epithelium been ulcered, surface will be covered by a fibrous-purulent membrane with an adjacent area of granulation tissue (6). Different varieties of calcification might be present. These calcification varieties account for mature lamellar bone, immature bone, dystrophic calcification, which are more common in initial ulcered lesions (6) and circumscribed shapeless material classified as "cemento-like" (7,8,2,3,4) may also be present. Although bone is generally trabecular type, older lesions might show mature lamellar one (6). The oldest non-ulcered lesions usually show well-shaped bone or cemento. Therapy for peripheral ossifying fibroma consists of surgical removal, periosteum inclusion (3) and periodontal ligament (9) as well as aggressive agent removal. This is quoted in the literature as a reducing approach of recurrence levels which is considered high (2,3,4). One in each 5 cases of ossifying fibroma suffers recurrence after its removal (10,11). Some authors report from 16% (5,6) to 20% (11,12) recurrence. This study reports a case of surgical removal of a extensive maxillary lesion, diagnosed as peripheral ossifying fibroma. A 32-year-old female patient, brown skin, searched maxillofacial surgery service complaining of a presence of a slow-growth mass for around five years. Although painless, it had been damaging her mastication and speech activities due to its achieved proportion, by withdrawing her from social life (Pictures 1 and 2). Picture 1 - Tumor exposure. Picture 2 - Dental pressing in the tumor surface. The anamnesis did not reveal existing systemic dysfunctions such as tabagism or alcoholism. At the face examination, it could be noticed an enlargement of maxilozygomatic area, excessive saliva and difficulty to keep lips sealed. At the intraoral examination, it was noticed the presence of a large tumor mass (Pictures 3), which affected from left tuber area to pre-maxilla, through middle line and covering the hard palate. 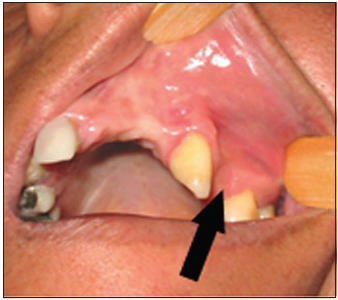 There were signs of dental pressing where tumor was in contact with occlusal surfaces of the lower teeth. There were also teeth displacement (Picture 4) and tongue position deviation caused by the tumor presence, besides lack of mouth hygiene noticed by the presence of calculus, dental plaque and radicular remains. The area in contact with left mouth vestibule was reddish, while the mouth cavity itself was pale pink. Manipulation on the tumor mass caused discomfort, by making a more detailed exam and an accurate dimension resolution difficult. 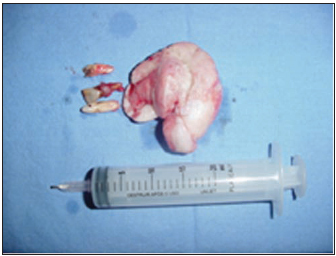 Picture 3 - Posterior extension of the tumor. Picture 4 - Displacement of the teeth. Diagnosis hypothesis accounted for pyogenic granuloma and peripheral tumor of large cells, and therapy approach consisted of removal biopsy followed by likely irritating factors. After being routinely examined, patient was submitted to surgery under general anesthesia with nasotracheal intubation. It was performed infiltration of a 1/90,000 adrenalin vasoconstrictor solution in the pedicle area of lesion, followed by tumor mass mobilization in order to evaluate its dimension. 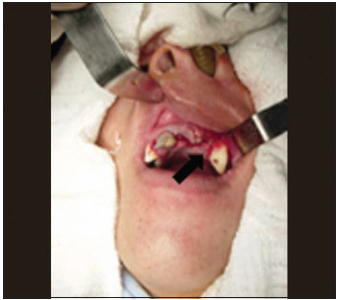 Incision was below pedicle area of lesion between lateral left incisive and canine teeth, with periosteal inclusion. Teeth which were adjacent to the tumor were also extracted besides alveolar and radicular curettage as a removal of possible causes of the lesion. After irrigation with saline solution and homostasis, the approaching of gum tissues was made through suture by using a 3.0 reabsorbable thread (Pictures 5 and 6). Picture 5 - Sutured mucosa. Picture 6 - 30 days after surgery. Ossifying fibroma is a slow-growth tumor, and most of its lesions are not larger than 2cm (6). Though, occasionally it can grow as far as 6cm (12). The highest incidence in this study was found in infants and in young adults, mainly at the age range from 10 to 19; affecting especially females (2-4 times). The reported tumor, which was operated, was 5 cm x 4.5 cm long, and was found in a 32-year-old patient (Picture 7). 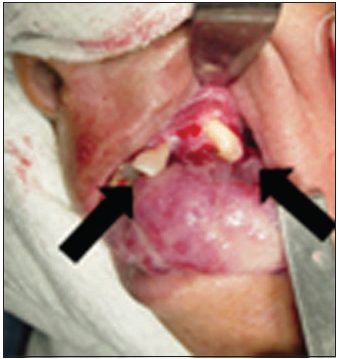 The fact that tumor was in contact with occlusal surfaces of lower teeth and the repetition trauma to which it was submitted caused and ulceration on the surface, by changing its clinical into erimatous appearance. Picture 7 - Tumor removed with irritating factor (teeth). In histological terms, ossifying fibroma is more cellular and less vascular type than the pyogenic granuloma. The observed mineralized tissue observed can be classified into blended irregular bone trabeculae, lamellar trabular bone, curved bone trabeculae and oval and/or spheroid ossicles (13). The literature states that the origin of the ossifying fibromas lies on interdental papilla and on pluripotent cell of the periosteum or periodontal ligament (6). By considering the great amount of recurrence in the literature, the current patient was evaluated 30, 90 and 180 days after surgery. She did not present any sign of recurrence; also presented mouth hygiene and absence of possible irritating conditions at tumor presence. Due to their clinical and histopathological similarities, it is thought that some peripheral ossifying fibromas develop as a pyogenic granuloma, which undergoes fibrous maturation and then ossification. These lesions are often mistaken and removed by superficial incision. It is important to remove lesion completely in order to reduce recurrences, by including subjacent periosteum and periodontal ligament besides their possible causes. 1. Oral and maxillofacial surgeon at Hospital Santa Catarina and Santo Antônio de Blumenau - S.C., Medicine student at Universidade Regional de Blumenau - FURB. 2. Medicine student at Universidade Regional de Blumenau- FURB. 3. Medicine student at Universidade Regional de Blumenau- FURB. This article was submitted to SGP (Sistema de Gestão de Publicações - Publication Management System) of R@IO on May 29th, 2007 and approved on October 12th, 2007 at 05:45:51.